Recipe in English if you scroll down! Dessa pepparkakor är goda och innehåller bara 40 %* kolhydrater (vanliga innehåller 73 %)! Ett utmärkt alternativ till sockervarianten. 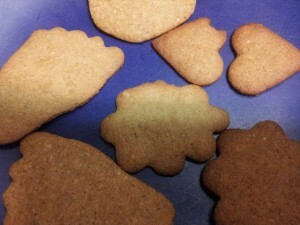 Eftersom de knappt innehåller något socker alls är de porösa i konsistensen och de duger därför dåligt till pepparkakshus. Bortsett från det är vi i familjen nöjda med det här receptet, särskilt dottern som nu kan äta i stort sett så många hon vill (och det är många)! * Om man räknar med agavesirapen. Det verkar mycket individuellt, men hos oss höjer inte agavesirapen så mycket som det borde enligt antalet kolhydrater. Ni får testa er fram, men det är i alla fall max 40 % kolisar! Räknar man bort agavesirapen helt blir det ungefär 25 % kh. 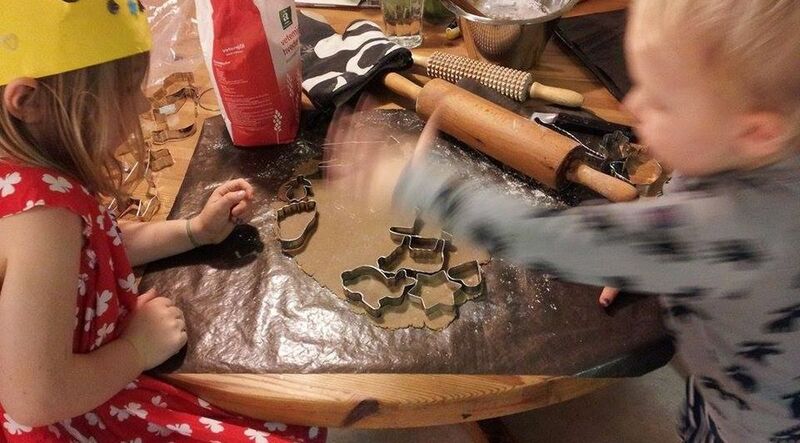 Vill du spritsa dina pepparkakor med kristyr, hittar du receptet här. Lägg sirap, Sukrin, farinsocker, ingefära, nejlikor och kanel i en kastrull och koka upp. Häll den varma röran över smöret och rör om tills smöret är smält. Rör ut bikarbonaten i vattnet och tillsätt. Rör ner ägget. Blanda mjölerna i en egen skål och tillsätt lite i taget till smör-röran, arbeta till en smidig deg. Lägg degen i plastfolie och låt den vila i kylen över natten. Baka ut som vanligt. Jag höll till på ett silikonunderlägg och behövde därför inte använda vetemjöl under degen. Dock fick jag mjöla kaveln då och då för att degen inte skulle fastna i den. Grädda i 200°C i nedre delen av ugnen, ca 5 minuter beroende på pepparkaksstorlek. Låt pepparkakorna svalna på plåten och lägg dem sedan på en bricka tills de är helt kalla. These gingerbread biscuits have a nice taste and contains only 25/40*% carbs (compared to ordinary ones that contains around 73 %). Since they do not contain much ”normal sugar”, thay are more porous in consistency and I guess they are not too good for making a bigger gingerbread house. A tiny one works, I have tried. Nowadays my daughter can eat as many gingerbread biscuits as she like (and that is many, indeed) without any problem for her or for us. * 40% is if you count the agave syrup. It seems to be very individual, but for us agave works fine and the blood sugar does not rise as much as it should compared to the carbs in it. Without counting the agave the carb content is around 25% instead, and that is what we count on. Put syrup, bown sugar, Sukrin, ginger, clove and cinnamon in a saucepan and let it boil. Put the butter into a bowl and add the hot content from the saucepan. Stir until the butter has melted. Put water and bicarbonate together and stir, then pour it into the bowl. Add the egg, and stir. Mix the different flours in another bowl. Then add little by little into the butterbowl and work the dough until it is smooth. Put the dough in plastic film and let it rest in the fridge over night. Bake it out as you use to do. I use a silicone mat which makes it all easier. I needed no, or very little, wheat flour under the dough. What you need to do though, is to put flour on the rolling-pin now and then, otherways the dough will stick to it in a very annoying way. If the dough is hard to work with, add some more flour. Bake in the oven in 200°C (392°F) and put the baking plate in the bottom part of the oven. Let it stay in there for around 5 minutes, depending on the size of your cookies and the efficiency of your oven. Let your cookies cool down a bit on the baking plate and then put them on a tray or a rack until they are totally cold. We store our gingerbread cookies (as long as they last…) in a cookie jar made of metal. If you store them in a plastic bag for example, they will probably get too soft. Hello. I love these cookies and am excited to try the diabetic version. However, I live in Texas, USA and I had to translate your recipe from Swedish to English. I understand the entire recipe except the part where you say ”I had to milk the cabbage occasionally because the dough wouldn’t get caught in it.” What does that mean? Did the butter not mix with the dough? Did it get stuck on the silicone mat? If you could help me out, that would be great. Thanks! Hi Arly! I’m happy you found this site! I have a plan to translate at least some of my recipes to English, but I’m not there yet. Thanks to your question I have now translated this one at least, and I hope my translation works better than the one you used… Automatic translations can be really confusing sometimes! 😂 I hope you enjoy the cookies!